UAV Industries says it is now the only on the continent to provide insured and legal flights using its pilots for various industries in SA. A Cape Town company, UAV Industries, has become the first drone company in Africa to be certified to train pilots and operate drones, receiving its remote operating certificate from the South African Civil Aviation Authority (SACAA). The company says it is now the only on the continent to provide insured and legal flights using its pilots for various industries in SA. Having trained over 120 pilots this year, UAV Industries says it will immediately bring economies of scale and accessibility to the sector with trained pilots in major provinces. Globally, the drone business is proving to be one of the most explosive new growth industries in recent years, with SA a relatively late bloomer. A recent study undertaken by ADS Reports notes the drone market has entered the growth phase and is expected to grow further in the coming years. The market is expected to be worth $21.23 billion in 2022, at a CAGR of 19.99% between 2016 and 2022. Regulations for drones, also known as remotely piloted aircraft or unmanned aerial vehicles, were put in place by the SACAA in July 2015. 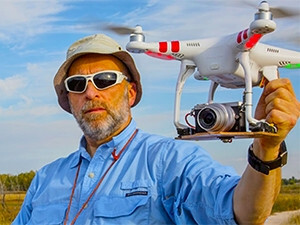 According to the SACAA Web site, the dangers of negligent operation of a drone are "collision with other aircraft, with possible fatal results, injury to the public, damage to people's property, legal liability for breaking laws such as privacy by-laws and other laws enforceable by other authorities". UAV Industries says with only a handful of training providers in the country, and thousands of uncertified and, therefore, illegal pilots, the industry is in urgent need of upskilling and compliance. It adds that as the local industry booms, dangers exist and collisions will rapidly become an inevitable part of operating. The greatest concern is that South African companies may not realise they are employing non-certified drone pilots, which puts companies, property and potentially lives at significant risk, says UAV Industries. "Fundamentally, it's about operational control in airspace. This is shared by all sorts of aircraft but when you are in an urban area, you might be flying over people or over a road or buildings, and there are risks attached," says Braam Botha, COO of UAV Industries. "In addition to this, you are not allowed to fly within 50 metres of a public road, person or property you do not have permission from, and unless you have gone through the training, have been approved by the SACAA, and have a remote operator's certificate in hand, plus some other requirements, you may not fly. It's a legal necessity, and as far as we've experienced, it's the only way you can be insured, because there are numerous eventualities such as flying into a property, a car, or a person," he explains. Botha adds that for hobbyists, that's not to say they can't fly. "The South African Model Aircraft Association (SAMAA) has a number of SAMAA-approved fields for their members and provide insurance for model flyers, but you can't make an income on the back of a SAMAA membership. To make a living, or work within a corporate environment, the legal process requires two licences - an air service licence from the Department of Transport and you need your remote operating certificate from SACAA. On top of that, your drone needs to be registered and approved by the SACAA and the individual needs a drone pilot's licence. "You will need insurance for third-party risk ? a drone crashing into a car ? but for the most part you can't get this unless you're a legal operator. I often compare it to a courier company not being insured or insuring its drivers. Businesses should know this and need to ask the questions of the pilot - are you insured, and are you and your drone legal?" Botha concludes.